Is it curtains for doughty Shivnarine Chanderpaul ! ~ way of WI Board officials !!! One may not be a fan of his crouched stance ~not the same when it comes to his utility and scoring – on that big day in Nov 2013, at Wankhede Test no. 2102 - naturally, Sachin Tendulkar garnered all attention. It was SRT 200 – his fare well test – the opponents WI aggregated only 166 against Sachin’s perfect 200. He played alongside Bhuvaneswar Kumar and Mohammad Shami, who were not even born when he made his debut ! On that special occasion, Clive Lloyd presented a cap to another man who debuted in 1994 and played his 150th test at Wankhede ~ the dependable leftie has now played 164 tests 280 innings scoring 11867 runs with 30 centuries and 66 fifties; in 268 One dayers he has made 8778 runs with 11 tons. IPL 2015 – the 8th season is over – MI was crowned – with every IPL, some youngsters rise to the limelight and some fade away. There could be a big list of players from whom much was expected but they failed ..... to me Virender Sehwag and Yuvraj Singh in that list would sadden. There would be the Q on whether they have played their last innings. Not all retirements have been pleasant. Many a players have been treated rather shabbily in their twilight .... remember that the greatest bowler of India, Kapil Dev who hurried the opponents to wear helmets in his debut – was once hit for 20 runs in an over in a ODI towards his end career [was that Phil Simmons !] – he was returning to bowl the next over, when he was rudely stopped by Azhar and ball thrown to somebody else. In Politics, heir-apparents are common – many fathers have ensured the career of their sons and daughters. In Cricket too, we have seen many of that – in Dec 2013, Tagenarine made his debut as an opener for Guyana; that may not matter much until you read his full name of Chanderpaul yes, son of illustrious father. The father Shivnarine Chanderpaul, a dodgy and difficult to dismiss customer who has made tons of runs for West Indies, is now in news. The man who has kept his own standards at a remarkably high level despite the perennial problems that West Indies have faced is facing axe. Chanderpaul's contributions have been immense, as he has defied bowling attacks in all countries and all conditions, often with minimal support from the other end. Shiv Chanderpaul appears set to be dropped for the Test series against Australia after he was left out of West Indies' 12-member group for a pre-series training camp in Barbados. Chanderpaul could still make it to the Test squad when the final team is decided on May 29, 2015 after the conclusion of the practice match between the Australians and the Board President's XI. 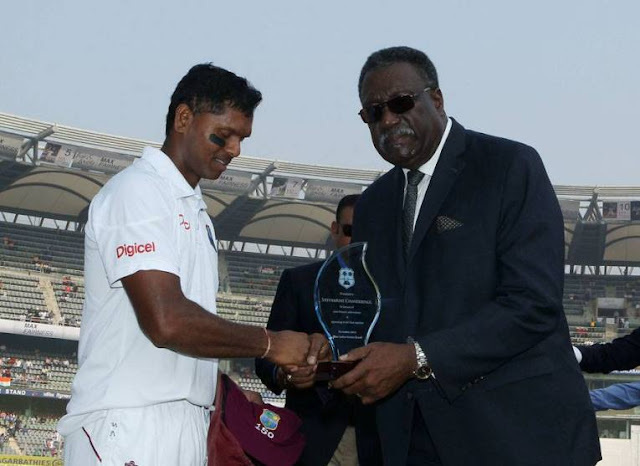 The chairman of selectors, Clive Lloyd, however indicated West Indies were keen on looking ahead. "This was a tough decision for the selection panel to make," Lloyd said. "We recognise the significant contribution Chanderpaul has made to the West Indies teams over the last two decades, but we want to take this opportunity to introduce a number of young, promising players into the squad." Chanderpaul is 86 short of equalling Brian Lara's record of highest West Indies run-scorer in Tests. However he would denied that going by what is heard from Clive Lloyd who feels that over the period there is decline in his form. In his last 11 innings, he has averaged only 16 ! – but looking at some of the players in the present squad, his class is unlikely to be matched. Sadly, the West Indies selectors ahve decided their team has a greater chance of beating Australia without Shiv Chanderpaul than with him. For Clive Lloyd, a fellow Guyanese, the decision to jettison a player as respected as Chanderpaul was a difficult one, but ultimately a matter of cricketing logic. In the loose collective of islands that make up the Caribbean it was bound to have created plenty of debate in circles both sporting and political, but Lloyd and the coach Phil Simmons were able to present a united and uncompromising front when explaining their choice of players to face Australia. To the selectors, he is 40 and not in the shape of what he was .... would apply to every player ! Simmons said that while they had considered the possibility of allowing Chanderpaul one final curtain call against Australia, it would not have been for reasons of sentiment. Once the selectors decided to move on, there was no thought of a farewell tour. He is quoted as saying - "It's not about giving someone two Tests to finish their career, it's about picking the right team to play the next game." There are plans in the works for an appropriate acknowledgement of Chanderpaul's career, a journey so long that it commenced in 1994, when Simmons was still part of the Test team and West Indies were still proudly in possession of an unbeaten streak that had begun in 1980. He has been a stubborn customer at the crease and it will be some time before Chanderpaul comes to terms with the decision. That stubbornness was evident in his refusal to concede that his career was on the wane, leaving Lloyd and Simmons with the difficult task of talking him through their judgment. The training squad of 12 assembled in Barbados will be swelled to 14 following the conclusion of the tour match between the Australians and a WICB President's XI in Antigua, in which numerous young hopefuls will attempt to prove themselves worthy of a Test berth. The IPL stars are not part of the squad !!!! Michael Holding, the former West Indies fast bowler, too has backed the chairman of selectors Clive Lloyd's logic of jettisoning Shivnarine Chanderpaul for the Australia series. Holding echoed sentiments - "Chanderpaul has to make way for someone younger. The person that comes in obviously is not going to fill Chanderpaul's shoes immediately. He has done so much good work for West Indies. But it is time for someone younger than him who can grow into those shoes." While Chanderpaul's former team-mate, Brian Lara, criticised the 'despicable' treatment meted out to Chanderpaul and called for a farewell series akin to the one arranged by the BCCI for Sachin Tendulkar, Holding said that he had "no problems" with the way the WICB had dealt with the issue. It appears that Chanderpaul has already played his last International innings. With legends Clive Lloyd, Mike Holding and Phil Simmons explaining, keeping out Chanderpaul might sound logical …… but do read this ~ the West Indies team which in 1980s looked invincible and had battery of pace bowlers [their support fast bowlers of that age, would easily have walked into any other team !!] has slid so rapidly – the Board and their handling of players has much to do in this. Dave Cameron and the WI Board handled the players thoroughly badly leading to their abandoning Indian tour midway in Oct 2014. This March, there were spate of retirements from players who have some more good years left. The 31 year old Lendl Simmons, who took Mumbai Indians to victory in IPL 8 announced his retirement following - Darren Sammy, Dwayne Smith and Darren Bravo. The dropping and the treatment pushed allrounder Kieron Pollard to take an "indefinite break" from first class cricket in Trinidad and Tobago (T&T). Earlier this season, opening batsman Adrian Barath pulled out of the team saying he, too, was taking a break. In March, the star opener Chris Gayle raised the possibility of retiring from Test cricket if his fragile back cannot cope with the increasing workload in a crammed cricket calendar. Sad for Shivnarine Chanderpaul and more so, for the islands of West Indies. FIFA trouble ~ indictment in US - arrests in Switzerland ... !! FIFA, a multibillion-dollar organization that governs soccer but has been plagued by accusations of bribery for decades, had several top officials arrested early Wednesday. The US Department of Justice indictment names 14 people on charges including racketeering, wire fraud and money laundering conspiracy. In addition to senior soccer officials, the indictment also named sports-marketing executives from the United States and South America who are accused of paying more than $150 million in bribes and kickbacks in exchange for media deals associated with major soccer tournaments. The Fédération Internationale de Football Association (FIFA) is an association governed by Swiss law founded in 1904 and based in Zurich. It has 209 member associations and its goal, enshrined in its Statutes, is the constant improvement of football. It’s mission is stated to be developing ‘football everywhere and for all’. FIFA’s primary objective is "to improve the game of football constantly and promote it globally in the light of its unifying, educational, cultural and humanitarian values, particularly through youth and development programmes". They claim to share their success of the FIFA World Cup to support football development projects in our 209 member associations across the globe. Their second objective is to organise international football competitions. FIFA’s goal is to touch, unite and inspire the world through its competitions and events. In a dramatic dawn raid, more than a dozen plain-clothed Swiss police officers arrived unannounced at the Baur au Lac hotel in Zurich stormed the rooms where senior officials from the world football's governing body were staying. Members from the executive committee were then led away by police through the side exit of the hotel, with many using bedsheets to shield themselves from the public eye. The timing of the arrests was explosive – coming just two days before the FIFA presidential election, which has already been dogged by controversy and claims of corruption. Sepp Blatter, who is widely expected to win a fifth term at the helm, had actively lobbied for a postponement of Friday's presidential ballot, according to FIFA insiders. At a hastily arranged press conference, FIFA portrayed itself as the victim, saying the double investigations had 'damaged' the organisation. Two criminal investigations into corruption at football's world governing body Fifa are under way, with seven top officials arrested in Zurich. The seven are among 14 indicted on corruption charges in a US inquiry, the US Department of Justice said. The second criminal case was launched by Swiss prosecutors into the bids for the 2018 and 2022 World Cups, to be held in Russia and Qatar respectively. US attorney announces indictment !! Fifa's Zurich headquarters has been raided, with electronic data and documents seized. US authorities searched the headquarters of Concacaf - the Fifa confederation for North and Central America and the Caribbean - in Miami, Florida, as part of their investigations. The US justice department said 14 individuals were under investigation worldwide for allegedly accepting bribes and kickbacks estimated at more than $150m (£97m) over a 24-year period. 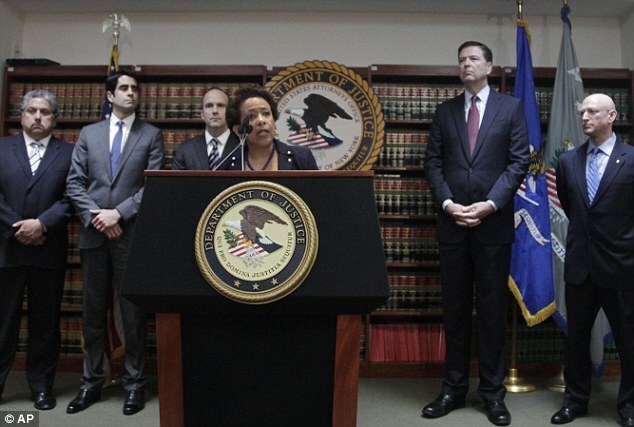 The indictment alleges corruption that is rampant, systemic, and deep-rooted both abroad and here in the United States," said US Attorney General Loretta Lynch. "Today's announcement should send a message that enough is enough," Acting US Attorney Kelly Currie said. Several officials have already pleaded guilty, the US Department of Justice says. These include Charles "Chuck" Blazer, the former head of Concacaf, who was previously on the Fifa executive committee. Many have wondered how Sepp Blatter can have been in charge of Fifa for so long amid so many reports of corruption and yet remain, apparently, untouched. One Swiss newspaper jokingly called him "the dark prince of football, the godfather, Don Blatterone" - but no inquiry has ever revealed proof of his involvement in corruption. What emerges, finally, is a man who both critics and supporters say cannot imagine his life without Fifa, a man whose tenure as president has outlasted three marriages. But as scandal follows scandal, Mr Blatter's determination not to leave his post willingly could see him bundled unceremoniously out of the back door. Both Swiss and US justice officials said the indicted officials had allegedly received $150m worth of bribes from the early 1990s for football tournaments in the US and Latin America. The alleged crimes were agreed to and prepared in the US via US bank accounts, the office of the Swiss prosecutor said, adding that the Swiss authorities could immediately approve the extradition. In the second case, Swiss prosecutors opened criminal proceedings "against persons unknown on suspicion of criminal mismanagement and of money laundering in connection with the allocation of the 2018 and 2022 football World Cups". Money involved in the two-decade-old bribery scheme passed through U.S. banks including Citigroup Inc. and JPMorgan Chase & Co., according to the U.S. Justice Department’s indictment. That helps give the U.S. the right to pursue prosecutions against the foreign nationals involved, and also to examine the role of the banks, acting U.S. Attorney Kelly Currie in Brooklyn, N.Y., said at a news conference Wednesday. The indictment doesn’t accuse the banks of wrongdoing, and didn’t indicate whether transfers in the FIFA case should have raised alarms or whether banks alerted the government. Financial firms in the U.S. are obligated to flag suspicious transactions to federal money-laundering authorities. In one case dating back a decade, executives from a company seeking Caribbean media rights for the 2010 World Cup wired $40,000 from an account at Citibank in Miami to a correspondent account at Wachovia Bank. The money was later transferred to a German bank account held by a Caribbean football official, according to the indictment. Reports by investigative journalists have earlier linked FIFA leadership with rapaciousness, corruption, bribery, and alleged vote-rigging pursuant to the election of FIFA President Sepp Blatter and the organization's decision to simultaneously award the 2018 and 2022 World Cups to Russia and Qatar, respectively. FIFA officials are accused of taking bribes totaling more than $150 million and in return providing "lucrative media and marketing rights" to soccer tournaments as kickbacks over the past 24 years. Now these allegations have culminated with the indictments of nine high-ranking FIFA officials and five corporate executives by the United States Attorney; several of these officials being taken into custody for questioning by Swiss authorities, who were launching a simultaneous, but separate criminal investigation into how the organization awarded the 2018 and 2022 World Cups. Those who, among these officials, were also indicted in the U.S. are expected to be extradited to face charges there as well. The U.S. Justice Department unsealed a 47-count indictment in federal court in Brooklyn that detailed charges against 14 people accused of racketeering, wire fraud and money laundering conspiracy. The most serious are the racketeering charges, which allege that the officials turned soccer "into a criminal enterprise," – right now the investigations appear much more complex and the head of the IRS Criminal Investigation division is quoted as saying - "This really is the World Cup of fraud, and today we are issuing FIFA a red card." The indictment "is the beginning of our work, not the end" of an effort to rid global soccer of corruption, said Kelly Currie, acting U.S. attorney for the Eastern District of New York. Officials claims the action to be something that no other police organization or other region has done so far on FIFA. It is also stated that they are now seeing a very powerful jurisdiction take action against a very powerful, opaque organization, FIFA." Soccer’s biggest sponsors have so far been largely silent on the Fifa news but that is unlikely to last. In 2014 Coca-Cola took the unusual step of publicly criticising Fifa’s own investigation into corruption allegations surrounding Russia and Qatar’s bids for the 2018 and 2022 World Cups. Gary Winston Lineker, whose tweet you saw at the start holds England's record for goals in FIFA World Cup finals, with 10 scored. He played five games in the 1986 World Cup, and was top scorer of the tournament with six goals, winning the Golden Boot, making him the first and to this day only English player to have done so. heat wave sweeping across India ~ killing more than a thousand !!! Summer is the time when animals too suffer – they also suffer the heat and become too thirsty ! ~ this photo from Daily Mail UK tells it all !! Often we hear from people, that temperatures are rising and it is hotter this year that it was before ! Chennaites are lucky – the ‘agni natchathiram or katri’ this year passed off somewhat ordinarily without harming much in Chennai – there have been brief of spells of rains too, bringing down the heat and fortunately there have been no power cuts. Not so, for many other parts of the Nation. Sad news is that the stifling heat has killed more than 1,100 people in India. The worst-hit area is the southeastern state of Andhra Pradesh, where authorities say 852 people have died in the heat wave. Another 266 have died in the neighboring state of Telangana. Titlagarh recorded a temperature of 47.6 degree Celsius, the season’s highest for the state. On 25th May, temperature of 47 degrees Celsius (117 degrees Fahrenheit) was recorded at Angul in the state of Odisha, according to the India Meteorological Department. Many of the dead are reported to be poorer people, beggars and the homeless as well as construction workers who are expected to work on building sites in direct sunlight. Heat waves are a consequence of global warming and India is feeling the impact of climate change through the increased instances of heat waves every year. National Disaster Management Authority (NDMA) defines heat wave as a period of abnormally high temperatures, more than the normal maximum temperature, occurring during summer. It has been torrid time for southern neighbours of Andhra and Telengana as roads reportedly were melted in the heat in the National Capital. In Telengana, 266 deaths have been reported where a maximum temperature of 44.5°C was recorded in Ramagundam city. Jangameswarapuram in Andhra was two notches higher at 46.4°C. The meteorological department issued “red box” warnings for Odisha, Jharkhand and coastal Andhra Pradesh, signalling high chances of heatstroke, dehydration and fatality with temperatures inching upwards of 45°C and conditions worsened by constant dry, sweltering winds. A sizzling sun baked large parts of Punjab and Haryana as maximum temperatures settled at a few notches above normal in most areas. Karnal in Haryana recorded 44°C, four degrees above normal, while searing heat swept Ludhiana in Punjab at 42.6°C. 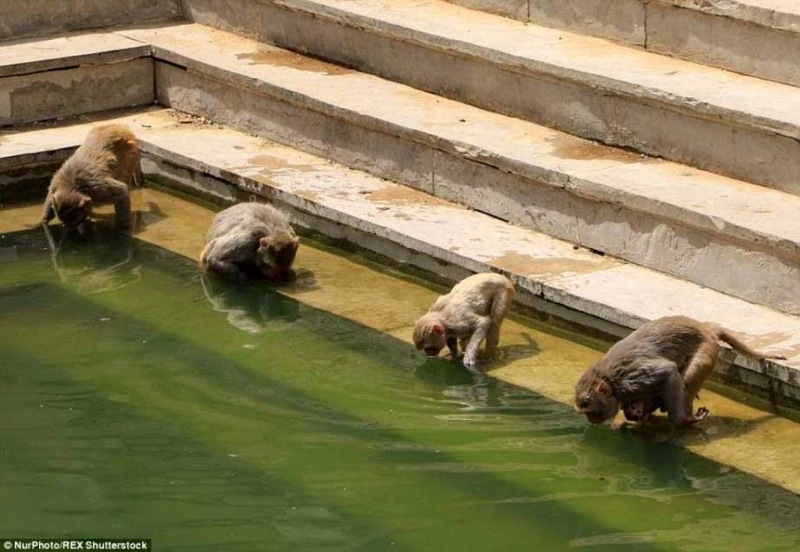 Agra was the hottest part of the state of UP with the mercury hitting 46.1°C. The heat wave was mainly triggered by an abrupt end to pre-monsoon showers and missing storms. A brewing cyclonic weather pattern in the Arabian Sea two weeks ago lost steam quickly, while depressions, or rain-causing systems, in the Bay of Bengal headed off towards the northwest states which are getting plentiful rains. Authorities have advised people to stay indoors and consume plenty of fluids and experts warned no let-up in the heat wave would lead to large-scale power outages in several parts of north India. The sweltering heat wave has not spared children and infants as well. In the last few days, several hospitals have seen a surge in diarrhoea cases in children between the age group of one to five years. In 2012, in Chennai, Commissioner of Police Sanjay Mathur inaugurated the juice distribution, a scheme introduced by Chief Minister Jayalalithaa. The Traffic Police are among the worst affected having to stand in hot sun and in summer their plight is pitiable. To mitigate the effect of heat, the scheme provided ‘lime juice’ for personnel performing duties in two shifts of four hours each – be provided juice twice in each shift.  When actual maximum temperature remains 45*C or more irrespective of normal maximum temperature, heat waves should be declared. Higher daily peak temperatures and longer, more intense heat waves are becomingly increasingly frequent globally due to climate change. India too is feeling the impact of climate change in terms of increased instances of heat waves which are more intense in nature with each passing year, and have a devastating impact on human health thereby increasing the number of heat wave casualties. In the hot Sun – not going out in direct sun; avoiding extensive physical activity; not sending children in sun; not letting out pets in hot sun and confining them in hot vehicles ; not wearing dark, heavy, tight clothing; not cooking during peak heat hours when there is less ventilation are also advisable. Two things that will not miss attention in Chennai today – is party cadres in vans, buses, and more …… and Police ! 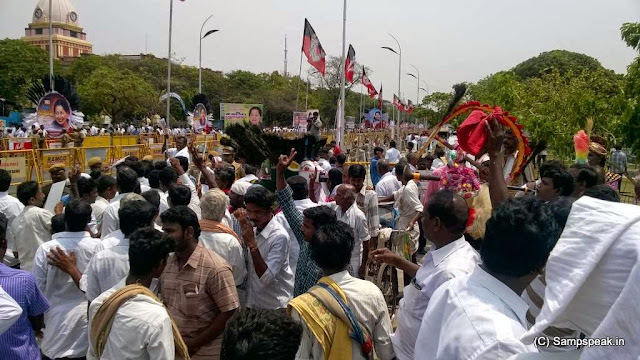 AIADMK general secretary Ms J Jayalalithaa was sworn in for the fifth time as Chief Minister of Tamil Nadu amid celebrations by party cadres and supporters all over the state. She returns to power nearly eight months after she was forced to quit over corruption charges. Ms Jayalalithaa took the oath in the name of God in Tamil in a simple function held at the University of Madras Centenary Auditorium in Chennai. Twenty-eight other ministers also took oath in a brief ceremony. Earlier, she arrived at the venue in a green saree and was welcomed by Tamil Nadu Chief Secretary Gnanadesikan with a bouquet. The swearing-in ceremony was attended by BJP leaders including Union Minister Pon Radhakrishnan and national office bearer of the party H Raja. Actors Rajinikanth, Sarathkumar and eminent music composer Ilayaraja were among the long list of dignitaries who attended the function. 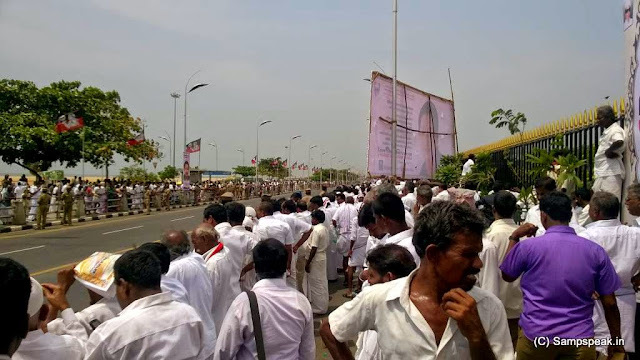 People could be seen swarming the Marina beach right from the morning – there were giant screens set up too, for viewing the swearing-in ceremony. 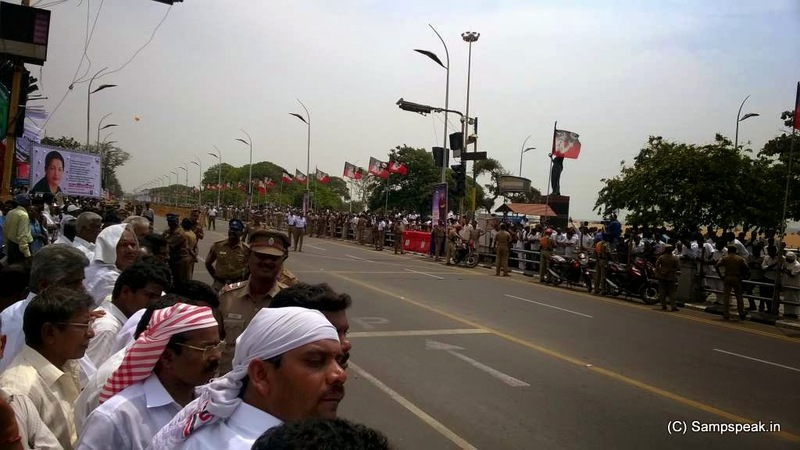 Traffic naturally came to a grinding halt - at Marina beach near the Cricket ground, approx 1.5 km away from the venue, thousands lined up on both sides of the road, patiently waiting for the cavalcade to pass. 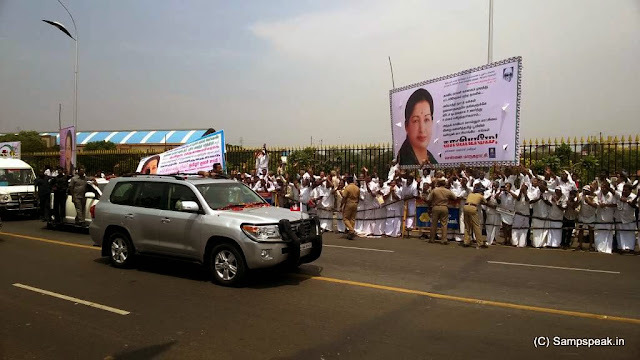 As Ms Jayalalithaa’ s car went past slowly and when she waved hands, people roared cheerfully. Ustad T24 - the Tiger ... now subject matter of Supreme Court case !! In 1998 there was a case of stabbing at Thrissur but Ramachandran was ‘acquitted’ by the court in the absence of sufficient evidence to prove the charge against him. Years later, there was another case before the Perumbavoor first class judicial magistrate Court related to the death of three women. On behalf of Ramachandran, a bond of Rs 30 lakh and surety of two persons were submitted to secure his bail. There would hundreds of such stabbing and killing cases in every Court – why should this be of any news ? Many large predatory animals can kill at will – yet may not see humans as suitable prey – but it is stated that when they kill and taste blood – chances are they would turn ‘man eaters’. Man-eater is a colloquial term for an animal that preys upon humans. Most reported cases of man-eaters have involved tigers, leopards, lions and crocodilians. There could have been chance savage attacks on humans as prey, by many animals including bears, Komodo dragons, hyenas, cougars, and sharks. A few months back, a tiger reportedly killed a woman in Pandaravalli village, in Bangalore was captured but was released in Bhimgad Wildlife Sanctuary. The decision of the Forest Department to release the captured tiger appeared to have backfired with apprehensive residents of Talawade village in Khanapur taluk demanding its recapture. Like many other things, these get buried with passage of time unless fresh incidents get reported. ‘Man-Eaters of Kumaon’ is a book written by Jim Corbett. It details the experiences that Corbett had in the Kumaon region of India from the 1900s to the 1930s, while hunting man-eating tigers and leopards. One tiger, for example, was responsible for over 400 human deaths. Australian shores are croc-infested and there have been news of crocodiles being responsible of killing persons. Tsavo is a region of Kenya located at the crossing of the Uganda Railway over the Tsavo River, close to where it meets the Athi River. ‘Tsavo', means ‘slaughter' in the language of the Akamba people. Until the British put an end to the slave trade in the late 19th century, Tsavo was continually crossed by caravans of Arab slavers and their captives. More than a century ago, British engineers and their African and Indian labourers spent five years carving a railway through what would become Kenya in a bid to open up East Africa's interior. Along the way, close to 2,500 workers died, struck down by malaria, attacked by lions or overcome by exhaustion. The Tsavo Man-Eaters – two maneless male lions, are the most notorious lions in history who over a nine-month reign of terror, killed so many men devouring them from their sites. Terrified workers built snares, thorn fences and bonfires to scare them off but the beasts simply crawled under or leapt over them to reach their prey. The Tsavo killings took place against a backdrop of intense environmental changes. Elephant populations had plummeted and as a result, woodlands were expanding and the savannah’s grazers were being driven away. Now a Tiger is in Court....... ‘Ustad’ or ‘T-24’, the ‘man-eating’ tiger of Ranthambore, escaped a caged life in a zoo by a whisker on 21.5.2015, when the Supreme Court decided that he would continue to stay in the Sajjangarh Biological Park at Udaipur in Rajasthan for now. ‘Ustad’ was branded a ‘man-eater’ after he mauled to death a forest guard on May 8. Within days of the incident, he was drugged and translocated 530 km from Ranthambore to the Udaipur park, considered a rescue centre. There was a petition filed by Chandra Bhal Singh, a Pune resident and tiger lover before teh Court that the wildlife department of Jaipur had failed to take requisite permission under section 12 of the Wildlife Protection Act (1972) before proceeding to translocate the tiger from the reserve. Saying that Ustaad had been given “capital punishment without a fair trial”, the petitioner contended that there was no forensic evidence that the particular tiger had killed the forest guard and three other people. But for the tiger, now caught in transit between his natural habitat and a zoo, a return to the Ranthambore forest, to his female companion and her cubs, is still a long way off. On the brighter side for the big cat, a Vacation Bench, led by Justice A.K. Sikri, has ordered status quo. That means, the tiger stays on at the biological park until the Rajasthan High Court decides his fate. The High Court will hear his case on May 28. The hearing itself was a rare gesture from the Supreme Court, which only considers urgent matters during the summer break. Mr. Singh, through counsel Sanjay Upadhyay and Salik Shafique, said ‘Ustad’ had only acted in self-defence when the guard trespassed into his territory. The tiger, he said, had merely acted to protect his family. His absence from the tiger reserve spelt danger to the tigress and the cubs left helpless in the wild, he said. The reference in the opening para is all about Thechikottukavu Ramachandran, 1964 born, owned by Thrissur Thechikkottukavu Peramangalthu Devaswom, one of the most valued mammoth, reportedly the second tallest elephant in Asia. Dhoni fined ...... for voicing on rank bad decision !! We have heard this so many times – at the post-match conference, the losing Captain would say – ‘the first session was crucial, we did not start well, a couple of bad decisions, tough decisions, a couple of bad shots. We were at the receiving end’ ............... and the hard fact that there have been poor Umpiring decisions which have marred the game and changed the course. Umpiring errors are not uncommon – once in Australia, Bruce Oxenford, gave a batsman out on referral, but later retracted stating that he had pushed the wrong button – when there are only two !! Remember that in 1975 tour, crowds chanted ‘sivasankaraiah ...... something rhyming but not good to be written here’.... Indian board peculiarly had the habit of restraining the Team captain in not talking to Press – but allowing visiting teams – thus in 1983 at Motera, Ahmedabad, when Kapil Dev had rattled WI clearly, Clive Lloyd criticised the Umpires and on the last days, a couple of Lbws were not given – the lead increased, and Kapil’s 9/83 went in vain. Recently, in the QF of WC 2015, when Bangladesh lost to India – hundreds gathered in the streets of Dhaka, burnt effigy of Pakistani cricket umpire Aleem Dar chanting slogans and calling it ‘ICC conspiracy’,” it was a 109-run defeat and for sure Rohit Sharma’s decision would never have altered the fate of the match. In 1981 at Melbourne, Dennis Lillee appealed against Gavaskar, umpire Rex Whitehead raised the finger. Gavaskar was adamant that the ball had hit his bat on the way to the pad. In protest of the decision, he stood his ground even after being given out. The comments of lillee and others infuriated him further, as he pulled out the non-striker Chetan Chauhan and started walking off the pitch. A timely intervention by Manager Durrani and Assistant Manager Bapu Nadkarni ensured continuance – ‘smoke was coming out of ears and i heard nothing’- Gavaskar was to say later on that. Chennai Super Kings skipper Mahendra Singh Dhoni has been fined 10 per cent of his match fee for “inappropriate public comments” on a doubtful lbw decision given to Dwayne Smith during the first qualifier of the Indian Premier League cricket tournament against Mumbai Indians. 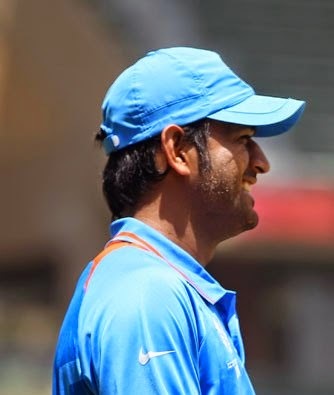 Following his side’s 25-run defeat to Mumbai Indians at the Wankhede Stadium, Dhoni referred to opener Dwayne Smith’s dismissal and called it a “horrible decision”. “We lost momentum in the middle, and not to forget Smith got a horrible decision,” Dhoni said at the post-match presentation ceremony. Smith was adjudged LBW after being struck on the pads off a full-toss from Lasith Malinga in the first over. Replays showed that ball would have gone down the leg side by some margin. Later Dhoni admitted the level 1 offence (Article 2.1.7 of the IPL Code of Conduct for Players and Team Officials) and accepted the sanction. Sounds in appropriate – it was indeed a poor decision, it was not protested on the field – but to say that it should not be commented upon at all, sounds too autocratic. It is time, Umpires are penalised for their errors, and unfortunately, the Indian board is adamantly against DRS. Way back in 1978, Bishan Bedi forfeited the 3rd One dayer protesting the blatant Umpiring decisions in failing to call wides. It was to be a 40 over a side affair – Pak made 205 with Asif Iqbal topscoring with 62. Kapil Dev, Venkatraghavan, and Mohinder took 2 apiece. India made 183 in 37.4 overs; 23 to be made in 14 balls with 8 wickets in hand – Bedi had to react as Sarfraz kept bowling bouncers and short pitched ones beyond the reach and 4 of them continuously were not called wides. Bedi realized there was no point in continuing and angrily conceded – which could create a great furore in modern time but went unpunished that day. Chetan Chauhan and Anshuman Gaekwad had opened the batting – Surinder departed at 163 making 62. Gaekwad with 78 and Gundappa Viswanath with 8 were at the crease – with Mohinder, Kapil, Ghavri, Bharat Reddy, Venkat and Bedi to follow – when Bedi took that decision to concede the match. Umpiring decisions are not to be protested is understandable, but to say that they should not be commented upon, is not good for the game. Marina Swimming pool to go private !! The sandy shores of ‘Marina beach’ known for its pristine beautiful sandy shores - runs from Fort St George to Besant Nagar. This beach has a long history. This was conceived in 1884 and christened by Mountstuart Elphinstone Grant-Duff, the then governor of Madras – the beautiful beach is famed for the ambience and rich eco system though it stands a lot polluted now. On the road side, many stone statues, some of them installed during the Tamil World Conference adorn the area. It keeps people healthy, providing the right ambience for the early morning walkers and those spend their evenings enjoying the sea-breeze, especially in sweltering summer. At Marina, one can hear the sea, the sound of waves and nearer – the waves jumping and touching the shore and then submitting themselves to the shore but trying to comeback to conquer again ! would be very interesting sight – One can see monstrous ships anchored in the middle of sea, some fishing boats and Sun coming out as a red ball from the Sea – all great sights to behold. To those given to enjoying Nature, the morning at Marina provides innumerable things.... down here, there are only 3 seasons – hot, hotter and hottest – though nearer sea, it would be lot pleasant in evenings. A swimming pool, [paddling pool or simply a pool], is a man-made structure filled with water intended for swimming or other water-based recreation. A pool can be built either above or in-ground, some on top of buildings, in hotels and even on luxury ships. The "Great Bath" at the site of Mohenjo-Daro in modern-day Pakistan was most likely the first swimming pool, dug during the 3rd millennium BC. Ancient Greeks and Romans reportedly built artificial pools for athletic training. Swimming is an important Olympic sport. This one at the 8th floor rooftop – you can see the backdrop ! Enabling people cooling down, there are two swimming pools along the stretch—the Marina swimming pool and the Anna swimming pool. The Marina swimming pool situate opposite to PWD/ Presidency College, was built in 1947 - 100m long and 30m wide, bigger than the standard Olympic pool size. It not deep – around 5.5 feet but for a small portion of diving pool of 9 feet, which is not operational now. The Anna swimming pool opposite the clock tower building of the University of Madras remaining partially hidden has two pools – one used a diving pool in earlier days and the other swimming with varying depths. Remember that in 1970s Anandhan [VS Kumar Anandhan from Velvetithurai, Ceylon] attempted a Guinness record at Marina pool, water treading [floating continuously] for 3 odd days. We witnessed him at Marina floating on water. Anandan achieved many other feats including a record two-way swim from Thalaimannar in Sri Lanka to Dhanushkodi on the Tamil Nadu coast. He passed away in attempting to swim the English Channel in 1984. The first South Asian Games [SAF] were held at Kathmandu, Nepal in 1984 and have since been held every two years except for some occasions. In 1995, it was held grandly at Chennai. During that time, infrastructure was created – we have the SAF village near Koyambedu and the Aquatic complex in Velacherry. The Complex was built at a cost of Rs.11.32 crores. 4000 spectators can watch aquatic events in this complex which consists of one 8-lane racing pool of 50m x 25m, one Diving Pool of 18m x 25m and one Warm up Pool of 25m x 25m, all conforming to international standards. Besides these facilities, one fitness centre and an indoor hall for gymnastics are also available in the complex. 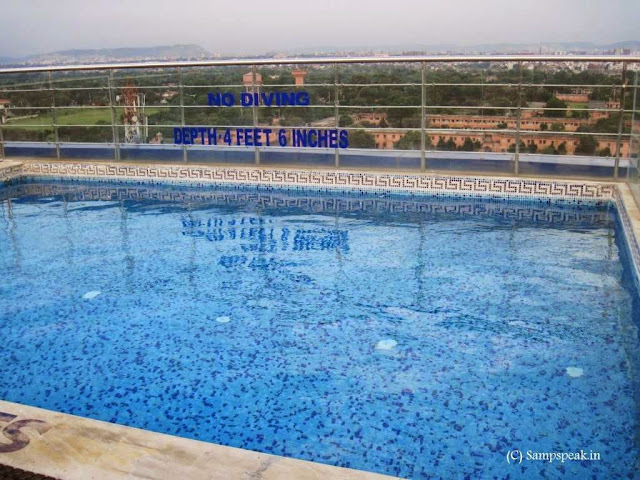 Chennai has some other swimming pools too – in Savera, Woodlands, and many other hotels. We have heard of ‘bleach’ which refers to a number of chemicals that remove colour, whiten, or disinfect, often via oxidation. The bleaching process has been known for ages, but not the same chemicals have been used earlier. Chlorine is the basis for the most commonly used bleaches, and many people commonly call calcium hypochlorite as the bleaching powder. Bleaching chemicals and chlorine are often used in water in pools to disinfect and keep it clean. This at times can cause eye-irritation too. Marine pool having been maintained by PWD would at times be not in great shape – for a few years now, there have been many coaching instructors who hire and teach their wards, the way to learn swimming. TOI Chennai Edition today reports that Marina swimming pool will from now be maintained by a private operator. Corporation of Chennai handed over the pool following an ‘e-auction’ that concluded last Friday. The auction started at Rs.35 lakh and the winning bid was Rs.45 lakh. Because of summer vacation, the pool will remain open to the public for longer hours: from 5.30am to 8.30pm.The same charge of `15 per hour will apply and it will continue to be free to students of corporation schools. The revenue from entries will, however, go to the private firm and not the corporation. The firm has been asked to provide facilities such as lockers and swim wear, which are chargeable. The primary revenue, however, will be through advertisements. “We have demarcated space on walls inside and outside the pool building, which the private operator can let out for ad revenue,’ said an official of the corporation. About 150sqm outside the pool and 75sqm inside will be demarcated for the operator. “Corporation will use 50sqm of this space to display our own announcements,” he added. To participate in the auction, all firms had to deposit Rs.5 lakh. The private firm will now pay Chennai Corporation Rs.45 lakh every year, which will increase by 5% annually . The contract is for three years. Based on its performance, we will take a call on renewing the contract for two more years, the civic official said. Team for Bangladesh tour - Harbhajan gets a recall ! For the tour of Bangladesh now, there was thinking that the Cricket board would balance by selecting Kohli for the Test and provide him rest for One dayers – and perhaps Dhoni too might rest after hectic IPL. There was some talk that as an act of grace, the Board might recall Virender Sehwag, Yuvaraj Singh, Zaheer and Harbhajan – allowing them a peaceful retirement – there was some talk that Suresh Raina might lead…. Nothing happened eventually – we have almost the same team that played in recent Aussie tour / WC cup. Recall that in that famous Test no. 1535 at Eden Gardens ever remembered for the masterly 281 of VVS Laxman and Ganguly reversing the winning streak of Aussies, occurred the hat-trick of Bhaji, getting rid of skipper Ricky Pointing, Adam Gilchrist and the wizard the great Shane Warne who was caught out. The Last decision was also reffered to the third umpire who decided to give it out, making it the first ever hat-trick by an Indian in test cricket. Harbhajan Singh returns to India's Test squad for the first time in two years after he was picked for the only Test in Bangladesh from June 10 to 14. The selection committee, which met in Mumbai on Wednesday, retained the majority of the squad that toured Australia in 2014-15 with the exception of left-arm spinner Ravindra Jadeja. He last played Test cricket in 2013, when he was picked for the final two matches of the home series against Australia that India won 4-0. Harbhajan took only five wickets in those games at an average of 40.80. "The Bangladesh batting order has six left-handers, keeping that in mind, we discussed with the captain and we felt it was necessary to have a second offspinner," Patil said. "I also want to point out we not only discussed Harbhajan. We also discussed other youngsters and considered them. Ultimately the selection committee and the captain felt this was the right choice for this particular tour." Could not the selectors have thought of a Swarupam Purkayastha of Assam, Malolan Rangarajan of Tamil Nadu or Jayant Yadav of Haryana or Parvez Rasool of Kashmir, if they were looking for an off-spinner only. Sunil Gavaskar is quoted as saying NDTV that the selection of Harbhajan shows the dearth of quality off-spinners in India. "Certainly it is not a good sign. It shows that we don't have many good off-spinners around who are pressing for a place in the team." Prince Charles visiting and shaking hands with Sinn Fein Gerry Adams ~ making news !!! Ireland is an island in the North Atlantic separated from the west coast of Great Britain by the North Channel, the Irish Sea, and St George's Channel. It is the second-largest island of the British Isles after Great Britain, the third-largest in Europe and the twentieth-largest on Earth. Politically, Ireland is divided between the Republic of Ireland, which covers five-sixths of the island, and Northern Ireland, a part of the United Kingdom. Following the Norman invasion in the 12th century, England claimed sovereignty over Ireland. However, English rule did not extend over the whole island until the 16th–17th century Tudor conquest. Prince Charles visiting Ireland and shaking hands with Sinn Fein leader Gerry Adams is making lot of news and reported in almost all global media because !!!....... Gerard Adams is an Irish republican politician, president of the Sinn Féin political party, and a Teachta Dála (Member of Parliament) for Louth since the 2011 general election. Sinn Féin is an Irish republican political party active in both the Republic of Ireland and Northern Ireland. The name is Irish for "ourselves" or "we ourselves", although it is frequently mistranslated as "ourselves alone". Originating in the Sinn Féin organisation founded in 1905 by Arthur Griffith, it took its current form in 1970 after a split within the party; Gerry Adams has been party president since 1983. Indians have read lot of history on Lord Mountbatten. Admiral of the Fleet Louis Francis Albert Victor Nicholas Mountbatten, 1st Earl Mountbatten of Burma KG GCB – known informally as Lord Mountbatten – was a British statesman and naval officer, an uncle of Prince Philip, Duke of Edinburgh. During the Second World War, he was Supreme Allied Commander South East Asia Command (1943–46). He was the last Viceroy of India (1947) and the first Governor-General of the independent Dominion of India (1947–48)........... in 1979, Mountbatten, his grandson Nicholas, and two others were killed by the Provisional Irish Republican Army (IRA), who had placed a bomb in his fishing boat, the Shadow V, at Mullaghmore, County Sligo, in Ireland. The bombing was followed only hours later by the massacre of 17 British soldiers near Warren Point close to the border with the Irish Republic. Prince Charles shaking hands with Sinn Fein leader Gerry Adams is described as historic first meeting in Ireland – as it occurred just 100 miles from where IRA murdered his great uncle Lord Mountbatten. MailOnline reports that Prince Charles became the first royal to meet Gerry Adams and warmly shook his hand in a momentous step in the Northern Ireland peace process before holding a private 20 minute audience with Sinn Fein's leadership. Putting aside the 1979 murder of his beloved great uncle Lord Mountbatten by the IRA, which Gerry Adams justified at the time, the heir to the throne agreed to the historic face to face meeting at the start of his four-day trip to Ireland. The Prince of Wales and the Duchess of Cornwall touched down on a chartered flight at Shannon Airport in Co Clare before travelling to the National University of Ireland in Galway city to meet the Sinn Fein president, less than 100 miles from Sligo where Lord Mountbatten was assassinated. Clutching a cup of tea, the heir to the throne smiled as Mr Adams grabbed his hand and leaned forward to speak into his ear and twice said: 'Welcome back to Ireland. I am glad to see you here' - once in Irish and then repeated in English. 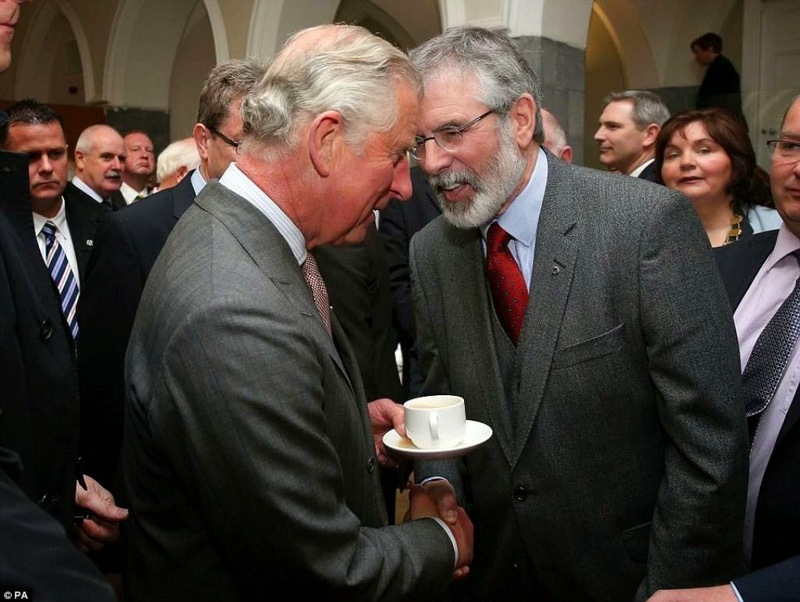 The Sinn Fein president said afterwards: 'Charles said he was glad to be here. It was a big thing for him to do and was also a big thing for us'. Adams has always insisted he is proud of his association with the IRA but the politician denied being a member of the paramilitary organisation, despite other members claiming he was a senior commander who personally ordered executions during the Troubles. After the historic handshake Charles agreed to a short meeting with him and Mr McGuinness, Northern Ireland's Deputy First Minister, where they discussed the Troubles and also touched on the murder of Lord Mountbatten. But Mr Adams refused to apologise and said afterwards: 'Of course I regret anyone was killed. There were brave people on both sides and there were innocent people who died. Both sides expressed regret for what happened in 1968 forwards. The prince is at the start of an emotional trip where he is visiting the spot where his great uncle was assassinated by the IRA. Lord Mountbatten, the Queen's beloved 'Uncle Dickie' who Charles called his 'honorary grandfather' and considered one of the most influential figures in his life, was killed by a bomb hidden in his fishing boat near his castle almost 36 years ago. Their meeting came three years after the Queen momentously shook hands with one of the terror group's former commanders, Martin McGuinness, who was also at today's reception. Adams had said at the time of the attack on Louis Mountbatten: 'With his war record, I don't think (Mountbatten) could have objected to dying in what was clearly a war. He knew the danger involved in coming to this country.' It was a veiled reference to Bloody Sunday and their insistence that Parachute Regiment, which has Charles as colonel-in-chief, was 'responsible for killing Irish citizens'. Charles' visit is being held amid strict security. Just last week six republican dissidents were arrested – and two pipe bombs and a pistol seized – in raids said to be connected to the official visit. Charles was devastated by the death of his mentor. But though he has been on two official visits to Ireland, he has never been to the scene of the murder to pay his respects. Charles will also visit the grave of Irish poet WB Yeats, who is buried under the shadow of Benbulben. 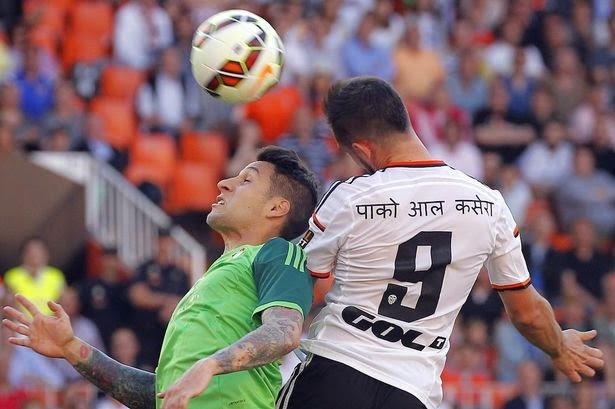 Valencia CF players wear jersies written in Nepalese !!! This famous club was established in Mar 1919 with Octavio Augusto Milego Díaz as its first president; incidentally, the presidency was decided by a coin toss. It moved to the Mestalla Stadium in 1923, having played its home matches at the Algirós ground ! Seismicity in the Himalaya dominantly results from the continental collision of the India and Eurasia plates, which are converging at a relative rate of 40-50 mm/yr. The April 2015 Nepal earthquake killed 9,000 people and injured more than 19,000 according to reports. It was the worst natural disaster to strike Nepal since the 1934 Nepal–Bihar earthquake. The earthquake triggered an avalanche on Mount Everest. Thousands were rendered homeless – some monuments were flattened too. A second major earthquake occurred on 12 May 2015 at 12:35 NST – this too caused deaths ! Valencia is the capital of the autonomous community of Valencia and the third largest city in Spain after Madrid and Barcelona. The Port of Valencia is the 5th busiest container port in Europe and busiest container port on the Mediterranean Sea. Valencia was founded as a Roman colony in 138 BC. The city is situated on the banks of the Turia, on the east coast of the Iberian Peninsula. Valencia Club de Fútbol also known as Valencia CF, is a famous Spanish football club based in Valencia. They play in La Liga and are one of the most successful and biggest clubs in Spanish football and European football. Valencia have won six La Liga titles, seven Copa del Rey trophies, two Fairs Cups (which was the predecessor to the UEFA Cup), one UEFA Cup, one UEFA Cup Winners' Cup, and two UEFA Super Cups. Founded almost a century ago in 1919, they are planning to move to new 75,000-seater Nou Mestalla in the north-west of the city. Valencia are the third most supported football club in Spain, behind heavyweights Real Madrid and FC Barcelona. They did it in style. Spanish first division football club Valencia extended solidarity towards the Nepal earthquake victims by wearing jerseys with the names of the players written in Nepali in a La Liga match. The Spanish giants wore the special shirts in their game against Celta Vigo on Sunday, and the jerseys will be auctioned off to raise money for the relief effort. It was a nice gesture as players had their names written in Nepali during their 1-1 draw with Celta Vigo. The one-off shirts will now be auctioned off to help raise money for the worldwide relief effort. Valencia partnered with the Red Cross for the charitable initiative, and will have won fans from across the football community for the gesture. On the field, a Nicolas Otamendi strike cancelled out Pablo Hernandez's opener for Celta Vigo and the match ended a 1-1 draw. Nepalese is an Indo-Aryan language. It is the official language and de facto lingua franca of Nepal and is also spoken in India, Bhutan and Burma. The Nepalese scripts are a group of Brahmic scripts of the Kathmandu Valley. The alphabets are largely in DEvanagari. message prank .... ' goat attack' paid apps !! Gujarat attempts to make voting ' mandatory ' !! ECB sacks Peter Moores rather unceremoniously !!! aams of Valsad - guarded by pathans on horses !! Digital daisy ~ the cow with bar code !!! is Ajahn Siripanno ~ the modern age Buddha ! !